The November 22nd, 2013 regional meeting ‘Strengthening Health Systems, Supporting NCD Action Meeting 2013 – Advocating for Policies and Action’ held in Trinidad, was a great success with over 60 delegates from 14 Caribbean countries, representing a wide cross section of disciplines including health NGOs, government, private sector, trade unions, women’s groups, the media, international organisations, service clubs, faith based organisations and medical associations. The meeting was a demonstration of the HCC’s ongoing commitment to the principles of partnership and collaboration, truly reflecting a ‘whole of society approach’ to NCDs. 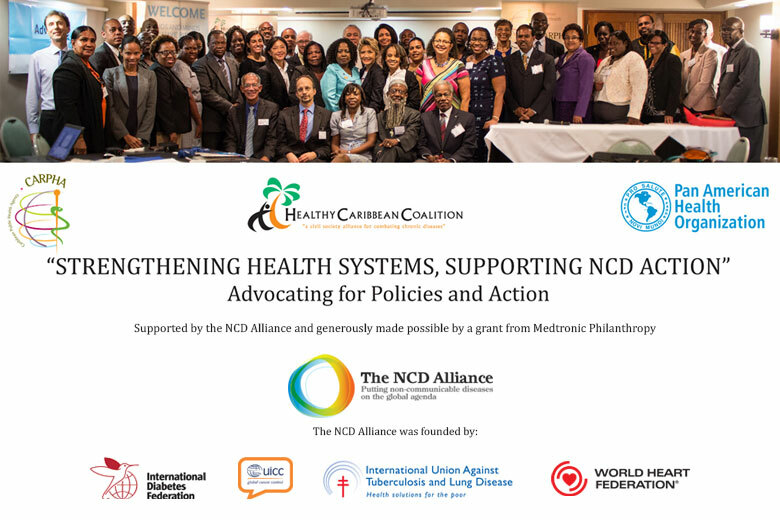 In addition to HCC Patron and International NCD expert Sir George Alleyne, key players from across the region including CARPHA, PAHO, CARICOM and UWI, came together in support of a multi-stakeholder approach to NCD prevention and control in the Caribbean. The meeting was a great success as key objectives were achieved and the HCC now looks ahead to the next phase of the NCD Alliance project. We would like to thank our members and our partners for their tremendous commitment to the HCC. A special thank you to our partners, PAHO & CARPHA for their support of this meeting and their ongoing support. Thank you to our funders, the NCD Alliance and Medtronic Philanthropy. Electronic Resource Pack containing NCD related reports, policies, plans, facts and figures and more download here. To find out more about the HCC Advocacy and Social Media Handbooks here.